Mercedes has introduced new technologies that will be implemented on the next generation of Mercedes S-Class. The innovations will mainly concern the active and passive safety features of the car, and anticipate the technologies that will equip lower segment vehicles in the next few years. The new safety systems have been developed to prevent accidents and to lower the risk of fatal injuries for the driver and the other passengers. According to investigations carried out by GIDAS and Mercedes-Benz, the new Brake Assist BAS PLUS system with Cross Traffic Assist could prevent up to 27 percent of accidents at road junctions, which result in 20,000 claims a year in Germany alone. 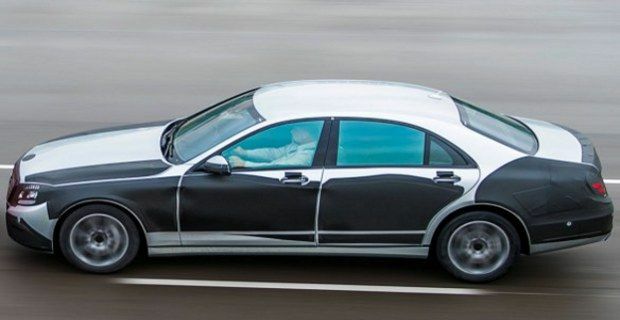 One of the main features of the new 2013 Mercedes S-Class will be the DISTRONIC PLUS with Steering Assist, which helps the driver to keep a centre position within the lane by producing an adequate steering torque. The system also automatically regulate the distance between the car and the vehicle in front that proceeds at lower speed. Pre Safe Brake has also improved: it can detects pedestrians and brakes autonomously to avoid a collision when the vehicle is travelling at less than 50 km / h.
Brake Assist BAS PLUS with Cross Traffic Assist is able to interpret traffic conditions at junctions and detect pedestrians as well as cars. The system increases braking power if necessary, to avoid collision and also warn the driver and tighten seat-belts to reduce injury risks. Pre-Safe Plus system is able to recognize when a car from behind is getting to close and warns the driver of that vehicle with rear hazard lights. If the collisions is imminent it will activate Pre-Safe Plus to protect the passengers, and also apply the handbrake, to avoid a front accident. Pre-Safe Impulse reduces the force of impact on the occupants by automatically adjusting the seat belts. The new Mercedes S-Class also presents further improvements on the standard safety features: Active Lane Keeping Assistant, which keeps the car in the correct lane, now monitors the traffic to detect incoming vehicles from adjacent lanes. Adaptive High-Beam Assist Plus differs from the standard system, because it doesn't just turn off the high-beams, but it adjust the lights in order to illuminate the road, without dazzling the oncoming drivers. Night View Assist Plus uses infrared night vision system to warn the driver when animals or people are detected, showing images of their location on the dashboard. It also warns pedestrians on the imminent approach of the vehicle. Attention Assist not only monitor the reactions of the driver, to determine drowsiness, but can also be programmed by the driver to alert the car of his poor physical health. The rear passengers will also be protected with adaptive beltbag that, in the event of collision, inflate to minimize the consequences of the impact. The rear LED lights can also be adjusted in order to get more or less brighter, to avoid distracting the other drivers. The Mercedes S-Class 2013 will be the first car on the market to have all LED lights, inside and outside.